Impressive Mediterranean Estate located in the prestigious 24-hour guard gated neighborhood of Indian Springs Estates. Custom home with 6 bedrooms and 8 1/2 bathrooms. Almost 9,100 sq. ft with on an over 2 acre lot. Expansive floor plan impresses from the moment you walk through the grand double door entry into the foyer that opens into the 2-story living and dining areas. Imperial staircase leading to the upper floor. The large kitchen features granite counters, stainless Viking double oven, 4-burner cooktop with grill and warming drawer. Double dishwashers and side by side Sub-Zero Refrigerator/Freezer. An oversized walk-in pantry and separate butler’s pantry allow for maximum storage. The kitchen opens to the sunny breakfast room and Family Room with bar and fireplace. The main level of the home also includes an office alcove, guest suite and Billiard room. Travertine and hardwood floors can be found on the main level as well as beautiful ceiling detail, recessed lighting and an elegant neutral decor. Upstairs the Master Suite is an oasis of luxury. The large bedroom features an elegant coved ceiling, private balcony, fireplace, breakfast kitchen, sitting area and dual bathrooms. One with a sauna, the other with a deep jetted therapy tub. Large walk-in closets for both as well as an attached bedroom with a separate entrance that can be used as a nursery or gym. This floor also includes 4 additional bedroom suites with high ceilings, ceiling fans and plentiful closet space. A rear staircase and laundry chute allow for convenient access to the large main floor laundry room with attached storage room. The sweeping circular driveway and parking area supplement the 2 garages, with parking for 5 cars in addition to built-in storage. The private backyard, with its sweeping grassy area frame a pool, spa and waterfall as well as a pool cabana with full bath and cozy fireplace. This is fabulous home with all the space and amenities you could want. Built in 2001 this is one of the newer homes in the Indian Springs neighborhood, coveted for its privacy and convenient location near the 118 Fwy. This community, surrounding by the topography of the Santa Susana Mountains, with its rolling rocky hills and rustic landscape has long been loved by the Hollywood film community, professional athletes and entertainers. With the appropriate blend of class, personality, and experience, the Kaseno’s each offer unique knowledge that contributes to their matchless business model. Stephen and Liz Kaseno maintain more than 60 years of combined real estate experience. 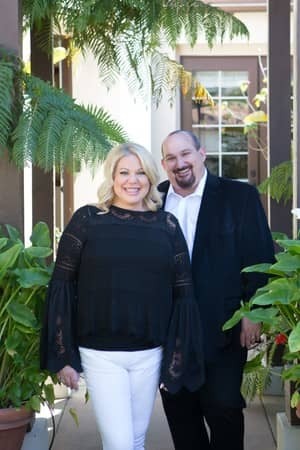 Dedicated to servicing their clients from the Conejo, San Fernando and Santa Clarita Valley’s to West Los Angeles, the Kaseno’s diverse background makes them a highly successful team.